Last month's Foundations of Mind FOM5 conference featured two main sessions and concepts—one honoring American physicist Henry Stapp's work and new book, Quantum Theory and Free Will, and the other addressing “The New AI Scare.” I presented a paper combining both of these concepts, making the main point that given Henry Stapp's idea that when a question is asked, Nature answers, it is vitally important that we teach Artificial General Intelligence (AGI) to focus on asking questions we truly wish to know the answers to. This same advice is excellent for all of us, since it's all too easy to get swept up in the 'drama' of the moment, where we might find ourselves dwelling on seemingly bad news. At such times when our attention turns to 'bad' news, it might feel tempting to ask questions we don't want the answer to. As I've learned after having my Kundalini awakening in 1994, and as I subsequently described in my book Reality Shifts, wherever my mind focuses I am likely to experience—and this can be enjoyable when I'm focusing on things I'd like to be part of, or it can be distressing, if I'm instead allowing my imagination to run downhill into fearful, worried directions. Such mind-matter feedback can occur very quickly when one's inner Ki (or Qi) energy is surging high, though it often arrives eventually for most everyone. Meditation and yoga masters who experience instantaneous mind-matter feedback wisely advise all of us to be mindful of how we can be of positive service in the world, rather than focusing on what we imagine we most want, that are often actually represent short-term and narrow, rather than long-term and more widely beneficial gains. We can thus all benefit from training ourselves to keep asking questions we genuinely desire to know the answers to, such as my favorite question, “How good CAN it get? !” which works well when applied to pretty much anything. This question thus can replace the kind of self-talk question many people ask such as, “What next?”! when they see something go in a direction they feel is wrong. By leaving a positive, open-ended question hanging for the Universe to address, we are inviting our imaginations to play in these positive areas, and we are much more likely to subsequently notice and observe what is going well. I encourage you to keep asking my favorite question, “How good can it get?” as you consider artificial intelligence, as well as any other area of interest in your life. There is a good change that by genuinely focusing on this question, and truly wanting to know, you'll help bring something truly wonderful into being that didn't exist before. when you're making a leap from one world of possibility to the next. This is the bag voted most likely to hold something you never put in it. 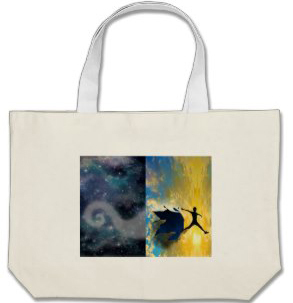 Dimensions: 14.5"l x 20"w; 7" deep. Squared bottom, perfect for groceries and large items, machine washable. Extra long cotton web handles with stress point reinforced stitching. "Wow! Wow! Wow! I am rarely at a loss for words, but Wow! was constantly pouring forth from me throughout my entire consultation with Cynthia Sue Larson. 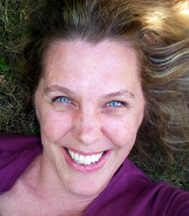 In the kindest voice, using the softest energy, Cynthia is a real powerhouse of Radiant Energy. She discussed ideas and thoughtforms that others never pick up on, she understood energies that others can't see, and discussed all of them logically, rationally, and professionally. I am soooo impressed! I received IMMEDIATE results and am still on a happy-feeling wave of Feel Good Love." When people hear about Mandela Effects, in which groups of individuals report remembering events differently from recorded historical records, some suggest as a possible explanation that Mandela Effect reporters are possibly experiencing false memories. The implication of Mandela Effects being "false" is made based on the assumption that whatever events are recorded are defined automatically as being "true," so therefore people must be mistaken in thinking that they remember specific things that are different from recorded historical facts. No mention is typically made that a presumption to call Mandela Effects "false" memories assumes a bias in favor of a classical physics view of reality--which is a view of reality that has started to look somewhat shakier recently. The connection between "false memory" and "Mandela Effect" have become so strong in recent articles and in a large number of mainstream media posts that the current definition for "false memory" on Wikipedia currently includes mention of the "Mandela Effect" on its "False Memory" Wikipedia page. The Fall 2017 UC Berkeley Physics magazine features articles on time crystals to qubits, research highlights from UC Berkeley, and special mention of Cynthia Sue Larson's book, Quantum Jumps: An Extraordinary Science of Happiness and Prosperity. 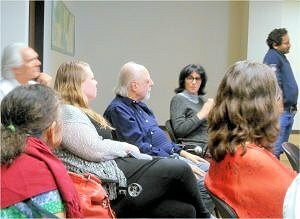 Cynthia Sue Larson talks with Aynne McAvoy about her experiences with angels starting in childhoodThe Foundations of Mind V (FOM5)”The New AI Scare?” conference was hosted by the California Institute for Integral Studies (CIIS) by the CIIS Center for Consciousness Studies in San Francisco on Nov 3-4, 2017. It featured presentations by: Henry Stapp, Fred Alan Wolf, Seán Ó Nualláin, Cynthia Sue Larson, Stanley Klein, and Beverly Rubik. This fifth Foundations of Mind conference was scheduled to coincide with and celebrate the release of Henry Stapp’s new book, “Quantum Theory and Free Will.” People registered through Foundations of Mind (FOM) participate in an ongoing series of conversational threads in areas related to consciousness, quantum interpretations, neuroscience, and higher education. Was a recent photo of ET researcher Mary Rodwell a case of “Spirit Photography” or just a classic example of double exposure? Reality is not black and white but infinite shades of gray. This is an idea that is often suggested when looking at the multidimensional aspects of truth. In this case, I’m speaking of the possibility that an image I showed during a recent interview with Mary Rodwell may in fact be a case-in-point. 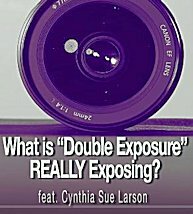 Cynthia Sue Larson discusses with Alexis Brooks what may be a case of double exposure revealing something that goes far deeper than a digital anomaly. Among the possibilities discussed is a case of spirit photography, a process made popular by Boston engraver William H. Mumler, who in 1862 took the first known psychic photographs. Mumler was stunned when he took spirit photographs that seemed to reveal images of dead relatives while he was taking photographs of family and friends. In this intriguing episode of Higher Journeys Radio, we also discuss the energetic influence in producing image anomalies and how emotion can play a role in capturing our more subtle bodies. A team of astrophysicists based in Australia and England has uncovered evidence that the laws of physics are different in different parts of the universe. Researchers from the University of New South Wales, Swinburne University of Technology and the University of Cambridge are publishing report of their discovery in the Physical Review Letters journal. These researchers point out how one of the supposed fundamental constants of Nature appears not to be quite so completely constant after all. 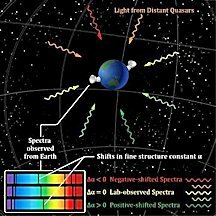 The fine-structure constant, referred to as 'alpha', varies throughout the universe. Professor John Webb from the University of New South Wales explained, "After measuring alpha in around 300 distant galaxies, a consistency emerged: this magic number, which tells us the strength of electromagnetism, is not the same everywhere as it is here on Earth, and seems to vary continuously along a preferred axis through the universe,"
I've been the center of some pretty odd and/or remarkable incidents over my life, a few of which I am sharing with you in this book. The incidents that I am sharing all seemed to carry a message or a lesson of some kind. Some of these incidents revolved around what some people call Time Slips. A Time Slip is just that, a slip in time. Something that happens that absolutely shouldn't have, couldn't have, but did. Something our minds struggle to comprehend HOW did this happen? If you were to hear it told from someone else's lips, likely you would question the accuracy of their story. However, these retellings are not coming from someone else, they are coming from ME. I was there, right in the middle of it, and even though that is so, even I cannot explain it. One such incidence happened around the spring of 2005. I was driving on Rt. 481 southbound in North Syracuse, New York and exiting at the Bear Road exit. This can be a pretty nasty exit ramp and I knew there had been a lot of accidents at that location for some reason. I was always extra cautious at that intersection because of that. At any rate, I was driving and my husband was in the passenger seat. The next string of things that happened all occurred within milliseconds of each other. I was on the exit ramp coming up to the stop sign. As I was pulling up to the stop sign, I happened to glance over at my husband. I suddenly "saw" him in a sling with a broken arm! I said (inside my head to THEY) "What's going on?? Why is my husband in a sling? Why did he have a broken arm in my vision?" THEY said "from the accident!" I said "What accident?" At that very same moment, I was now at the stop sign. I checked left, right and then left again. (I always check three times; I’ve been in that habit for years. There was absolutely no traffic coming in either direction. In fact, from the left side there was quite a good line of sight and all was clear. At that very same moment as I began to pull out to make my turn, my husband shouted "WATCH OUT!! STOP!!" I hit the brake hard and there straight ahead of me was a white station wagon full of people! There is absolutely no way that car could be there, yet it was! It had come from my left and as I said, I had a good line of sight. I had just looked there not once but twice within seconds of it being right in front of me, yet that road was clear as clear could be! I now understood the vision of my husband in a sling and being shown this aftermath of the accident...if it had actually happened. THEY had warned me, and my husband had also seen the car in time. Where did that car come from? I have no idea, other than to say perhaps it was a time slip. Something that happens that everything in our brain says that couldn't have happened, yet it did. A slip in time. If you consider that there really isn't any such thing as time, it can give you a headache just thinking about it. One day my camera disappear and I checked my car down to the springs of the seats. A week later I got in my car and there it was in plane view, on the floor. Note from Cynthia:Thanks so much for sharing your experiences with me, with your camera disappearing in the car, and then reappearing a week later on the floor of the car! Some changes in the Bible include many versions that now say “tables” instead of tablets, such as this passage from the King James Version, Exodus 24:12, “And the LORD said unto Moses, Come up to me into the mount, and be there: and I will give thee tables of stone, and a law, and commandments which I have written; that thou mayest teach them.” And also in Exodus, 31:18 in the King James Version, “And he gave unto Moses, when he had made an end of speaking with him upon mount Sinai, two tables of testimony, tables of stone, written with the finger of God.” Many other versions also now say 'tables,' as can be seen at: http://biblehub.com/exodus/24-12.htm. Another change that is very dramatic involves the unicorn in the Bible, “Will the unicorn be willing to serve thee, or abide by thy crib” in Job 39:9. Note from Cynthia:Wow, these Bible changes are amazing! Thanks so much for sharing them! Thanks so much for writing to me with regard to your question about a foolproof quantum jumping method. The simplest answer is that "it depends." Since we are all quantum jumping all the time, though most of us remain unaware it's going on, bringing this skill to conscious awareness and having good results depends more on spiritual development, self-awareness, and attunement than any one-size-fits-all methodology. I thus work one-on-one with clients to help them individually recognize, resolve and clear various blockages, beliefs, energy alignments, areas of focus, and so forth--much the way a mechanic might fine-tune how an automobile operates, to ensure best functionality. 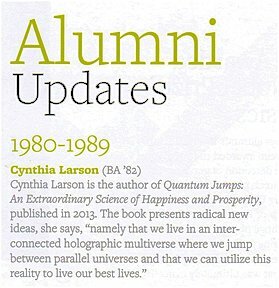 And having said all that, I do share laboratory-tested, scientifically proven tips and exercises in my book, "Quantum Jumps" that you might enjoy. Thanks also for your comments about AI. I'm definitely keeping a "how good can it get?" attitude with regard to AI, hoping to experience the best that is possible! Yes, I believe we can be assured any system is secured (having worked in Information Security, and learning this in the first day of training), and clearly we risk getting in over our heads any time we find ourselves needing to secure AI systems with other AI systems--which seems to be where things are currently heading. I have other concerns as well--mostly that humanity as a whole is rather complacent, and too easily seems content to settle into letting the various 'smart systems' do things for us. I'm grateful to so far only have one so-called 'smart' device--my dishwasher--and that's only because they no longer make dishwashers that don't have the capability to be part of the internet-of-things. I've opted out of 'smart meters' and still don't own a cell phone. But I see I'm quite the exception, and concur with your assessment regardnig the driving motivators behind AI development being based on greed and arrogance. And much of this is what will be discussed at our conference this Friday and Saturday; none of us attending are materialists, nor greedy. While I do believe that you and I and everyone around us changes the past (and yes, I do mean this happens literally to the physically measurable aspects of recorded history), in the interest of clarity I feel I must point out that our ability to change certain specific events to our liking is not (yet) something everyone can simply learn. I do not mean to give such an impression that one could simply snap one's fingers, for example, and have entire sequences of events realigned more to one's liking. What I am instead writing about and sharing are signs pointing to ever-increasing evidence that the historical past is not fixed, nor is it written in immovable stone, but rather is something that all of us can witness changing. Most of us seem to be presently unaware that this is going on. Some people are noticing things such as the placebo effect, reality shifts, and Mandela Effects, and are suddenly wondering "How can these changes be happening?" 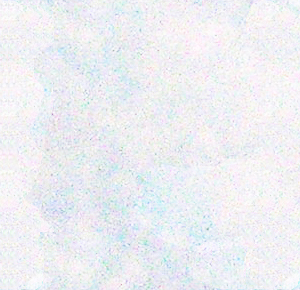 To answer your question, I will say that while I do believe anything is possible, I have noted that the people capable of bringing about intentional changes often seek no fame or recognition for their ability to do so--since those who tend to be most likely to witness the greatest number of and the greatest variety of such shifts tend to be spiritual seekers and adepts, engaged in spiritual energetic and meditative practices. There is a human tendency to feel things may be better if we get what we think we want--yet most of us are not yet well-aligned between our bodies, minds and spirits. This lack of alignment is both a natural safety mechanism limiting how much change we witness based on what we desire, and also a kind of built-in indicator for us to know we are actually intending for events to change in ways we will fully and completely appreciate and intend on every level of our being. So there is no fast and easy way I know about to change one's past. But having said that, I know that we can see changes in our past. For best results, I suggest adopting a spiritual path. 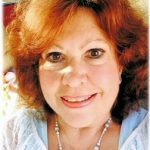 I do spiritual life coaching, and can assist you in developing these skills--though I can't promise changes would happen immediately, as this is a process. 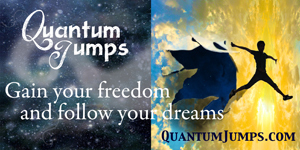 Thank you for sharing your appreciation for Quantum Jumps; I'm delighted to learn how helpful and inspirational you found this book to be--you've made my day! Thanks for writing to me with this question! The best results I've seen with regard to telling stories of the past and later finding history has changed happens when we are truly grateful for various past events--especially past events we've had something to do with, and some influence over. A genuine feeling of appreciation and gratitude makes a difference here, and subconscious emotions and energies truly matter. You might well be surprised to later notice a number of changes in your reality, most of them in ways you enjoy. I also recommend using an intentional focus toward imaging you're discovering how good life can get, and asking that foundational question (in any of its many possible varieties and forms), "How good can it get?!" and really and truly desiring to find out. When Naomi watched her daughter, Hana, slip into the grips of life-threatening brain tumors, this former nurse and couageous mother rose to the challenge of finding a way--any way--to save her daughter's life. 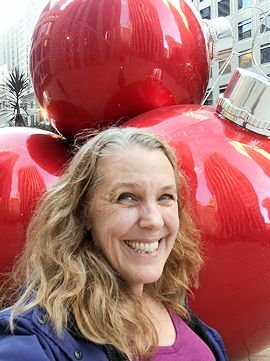 What Naomi could not have known is just how many twists and turns would be involved on this path to healing, nor just how frustrating it can be to move from the side of proactive medical professional to that of being resigned, stoical "patient." Family members will relate to the passion Naomi feels as she describes the annoyances experienced when attempting to communicate what she'd researched and learned to some condescending, curt, or disinterested medical experts. Fortunately, Naomi also encountered a number of open-minded, respectful cutting-edge scientists and medical researchers who greatly appreciated Naomi's ground-breaking discoveries on her path toward finding health solutions for her daughter, Hana. Written like letters to a best friend, "How She Healed Me" conveys the best feelings of love, and all the roller coaster of emotions that come from seeing one's loved one battle cancer, massive weight gain, loss of mobility and more--while other family members undergo the emotional pain of being part of the struggle. I found myself loving Naomi and her intrepid commitment to do whatever it takes to find healing for Hana, and the whole family. I love how this book describes in great detail a wide variety of western conventional involving surgeries and prescription medication and not-so-conventional healing modalities, with details about the pros and cons of each, and why Naomi and her family made the choices they did along the way. While not intended as any kind of medical advice or medical guide, "How She Healed Me" nonetheless provides brilliant practical insights into the value of such things as: ketagenic diet, reducing EMF exposure, the power of spirituality and love, homeopathic treatments, oxytocin, working with crystals, seeing and working with aura and Ki energy, hypnosis, past life regression, Reiki, Theta Healing, and more. I highly recommend "How She Healed Me" to anyone interested in the changing topography of western-eastern medical treatments, and this time of transition toward medically-informed, motivated patients.